The Best Bark Collars Tested, Rated, and Reviewed. Noise no more! Home » Pet gear » The Best Bark Collars Tested, Rated, and Reviewed. Noise no more! One of the biggest complaints from dog owners and their neighbors is when dogs bark randomly for no reason. It’s not a big deal if your pup barks just once, but when they do it continuously, it can become a problem. Don’t worry, though, because the best way to deal with this might just be a bark collar. However, the best bark collar can help your dog learn when it’s okay to bark, but it’s important to be sure you’ve got the right one. Make sure you start off with the lowest setting and only increase if your dog doesn't respond. We also recommend to start with the No Shock (vibrate or tone) setting on the device as a shock can really scare your dog. This bark deterrent collar is safe and humane as it uses 3 training modes, Beep mode, Vibration and as a last resort, shock. It can be used for large dogs of up to 210 pounds and PetSpy offers a money-back guarantee, as well - which shows you have nothing to lose. We also love that it has a sturdy plastic strap that is completely adjustable, so you’ll be sure that it can fit your dog with no problem - no matter how big or small it is. It has the most levels of correction of any collar we've reviewed - 16 all together, so you should find a level that works for your dog. The beep version will simply send a warning tone when you press the remote and you have to manually increase the level of beep, vibration or shock as a last resort. 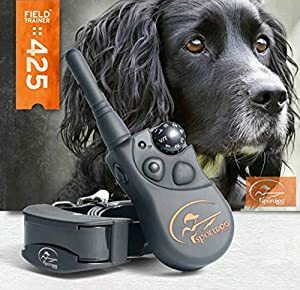 Customers loved that it was completely waterproof and you could use it on two dogs at the same time, which makes their households quiet and peaceful, clear from any loud and noisy barking. For effective prevention and correction of excessive dog barking, a shock collar is ideal, particularly the No Bark Collar by PetGishi because it is safe and harmless both to the user and the dog. The static shock produces a tingling, itchy sensation to your dog which will bother it to keep quiet. It has two smooth electrode tips that - when it comes in contact with each other - produces the mild shock. This No Bark Collar also helps train your dog, teaching it the right time to be quiet and not bark at every unnecessary thing. One thing we love about this collar by PetGishi is the fact that it’s a very cheap, no-hassle correction medium. It has an advanced processor with a chip that detects the dog’s bark - with this, it eliminates the use of a remote. When training your dog, you have to begin gradually and that’s why this product is so great because it has seven sensitivity levels - level one being the least sensitive and level seven, the most sensitive. It was designed with all breeds and sizes of dogs in mind, so you can surely use this on your pup. This collar is a user favorite, as well - many customers who have bought it have said nothing but praises. It has worked amazingly for them and has really helped their dog to not bark unnecessarily - giving them peace and quiet in their homes. This bark collar from Casfuy has three training modes which includes beep, vibration and shock - where the intensity increases with each step. For the shock mode, there is a 0-7 adjustable grade; 0 is a grade that produces no shock at all, which may be needed in some cases when you want the dog to be free, to be itself and enjoy the pleasures of barking. What sets this product apart from the competitors is that not only is it rainproof, it also has a built-in USB rechargeable battery which only requires a short charge time with about 20 days of use. This can be very useful especially when you are in places where you may not have access to electricity, like when you go camping with your dog. Furthermore, it has an in-built security mechanism that keeps your dog secure by automatically deactivating the collar - this is in case a little one starts playing around with the dog and collar and activates the collar seven times or more in one minute. A lot of buyers loved this product especially the useful adjustable levels in the collar. Not only that, though, they appreciated that the price was reasonable for something so functional and that it comes with clear instructions, ensuring that you won’t make any mistakes when setting it up. We love this collar because it has numerous features such as water resistance due to the fact that it has nylon and adjustability - ensuring that it fits any canine size. However, there’s more - it features a remote transmitter that works like a remote control, designed to control two dog collars. It’s easy to work with and all you need to do is buy an extra collar. The transmitter can cover a range of 330 yards maximum and that is good if you have a large compound. This is affordable and cost-efficient when you have more than one dog as it has lithium batteries that are rechargeable. If you have a seeing dog in case of disabilities, the collar comes with a light mode that can be used in places of poor lightning. Within 10 seconds, you can pair the remote transmitter with the receiver collar, so you don’t have to stress about connectivity. Most users have found they do not need to use the shock mode as the vibration mode does the job well. So, if you are still not a fan of the shock therapy, then this is good news as you probably won’t need to ever use it. The Mothca rechargeable training collar has a different style of teaching and training your dog without using pain. Instead, it has continuous activation of about seven times in one minute to get your dog to do what it should. It uses sound detection chips that recognize only your dog’s bark which cannot be triggered by other dogs barking and has an intelligent anti-injury chip that will protect your dog from harm. It has a 2017 upgraded version that allows you to see the bars of the battery through a digital tube and charge when required. The digital tube also helps you to see the different gear shocks of 0-7, which can be very useful. Additionally, it is rainproof, but can be affected by too much water. The collar quite a capacity when it comes to your dog’s weight as it can handle dogs from 6.6pounds to 120 pounds. Customers loved this product because it didn’t take a long time before their dog was trained - one even said that it only took three vibrations for their dog to stop barking. They’re all impressed with how well it works and love the fact that it’s customizable. One reason why this Electric No Bark Collar by Vastar is so popular is because it comes with an adjustable collar running right in front of the device. It is a high-quality electronic with a replaceable 6-volt battery with low battery consumption. It has the usual 7 sensitivity adjustable levels which can be controlled by the + and – sign. The Vastar AG555 dog collar goes through all 7 levels of stimulation before it rests for one minute to allow your dog rest before it repeats again. However, don’t use this collar for any dog lighter than eight pounds to avoid hurting the poor dog. What’s more, i comes in different colors of violet, dark blue, spring green and many more, giving you a plethora of choices to choose from. The people who purchased this product were pleasantly surprised by how well it worked on their dogs and they love that it was quickly able to help their dogs stop barking. They also love that it’s safe for their four-legged friends. This training collar that helps your dog control its barks is specifically made for small and medium dogs like a Pug, Terrier, Labrador, French Bulldog or any dog in that size category. It is made with a modern design and a heavy-duty collar that will last you a long time. This collar is great because just the beep alone will bring out the best behavior in your dog. It features seven different correction levels and has very beautiful colors that you can choose from. We love that it only requires one lithium metal battery even though it’s so efficient. This collar really surpassed the expectations of a lot of the customers and has really helped their dog to behave well and to stop barking unnecessarily. They love that it’s easy to work with and that it’s safe for the dogs. You will want to buy a collar with a buckle that will not rust and that’s why this collar by Pet Pawsabilities is so great because it features a no-rust buckle. It is also designed with safe, round probes that will not cut into your dog - causing pain - while it is going about its life. Equipped with seven levels of correction and seven levels of bark sensitivity, be sure that your purpose of investing in this dog collar will not be wasted. To make the battery last even longer, it is recommended that you take it out of collar when it is not in use. The customers loved that it was definitely worth the price as it really helped their dog to either be quieter, or to stay completely silent. Many have said it has worked like magic for them and their house and lives are much more quieter and at peace because of this product. If you are not in the market for a collar that is too techy, then this basic bark control collar is just right for you. It is ideal for dogs that weigh above eight pounds and unlike many other collars out there, it has a 6-level progressive static correction. Moreover, the collar is waterproof so your dog can still enjoy a swim on a hot day. It is light and has a battery indicator that lets you know when you need a new battery, which is a useful and important feature. This collar really helped many of the customers who bought it - one customer doesn’t even need to use it anymore because it has completely stopped their barking issue. They love that it’s effective even on the persistent dogs and that it was worth their money. The SportDog collar is outstanding because it has three programmable modes - this allows you to program what works for your dog at different stages of its training and saves you the stress of going through all levels all the time. Most of the purchasers were extremely pleased with this product because it was able to effectively and quickly stop their dog from barking incessantly. What’s more, they love that it’s rechargeable - so you don’t have to use up a lot of money from continuously buying batteries. These simple, yet amazing tools transmit sound or tactile signals to your dog when they bark randomly - this will help you train your dog not to bark at nothing. However, there’s no reason to worry about it hurting your dog because rest assured that these collars are perfectly safe. All bark collars do is prevent barking by giving your pooch just a small correction which will ensure that your dog knows when it’s okay to bark and when it’s not. In other words, it will not make your dog feel threatened. Excessive barking can actually be dangerous for your dog’s health since their heart rate might go up too high and they become too exhausted, so these collars are a good option to help them. On top of that, you can help build your bond with your dog, too. Keep in mind that bark collars are not made to control all barking and won’t restrict your dog completely. Basically, they work by detecting when barking occurs by sensing the vibrations and the collar will then give your dog a slight stimulus to warn them to stop. Fit the collar snugly around your dog’s neck for both training and safety, so the mechanism in the front releases the deterrent properly. Deterrents can range from an irritating high-pitched sound, to a spray of citronella, to a little static shock via the metal prongs of the collar on the neck. The level of correction can be fairly mild and may increase the level of punishment until the dog stops barking. Just be sure that the collar is positioned correctly so they feel the punishment. Remember, though, that you can also reduce barking by looking at other aspects of your dog’s behavior. After all, it’s best not to punish your dog if they’re barking out of ﻿anxiety or fear; if that’s the reason for the barking, the collar may not work as well as you’d like, either. Many people who buy bark collars think that they’re not working properly when they put them on the dog, but in actuality, most of the time the collar has not been fitted properly. If you want the deterrent to work as it should, position it in the right spot to detect the barking. Make sure the metal probes are connecting to your dog’s skin and that the collar is high up on the neck, right under the jaw line. This will be the narrowest part of the neck, which will prevent the collar from slipping off or not working properly. You may also have some trouble getting the collar at the right amount of tightness - this is because these collars are traditionally tighter than a normal leather or nylon collar. However, rest assured that they will not hurt your dog as your pup has a powerful neck. It won’t obstruct your dog’s breathing and needs to be tight enough so that it doesn’t move around. To help fit it on your dog’s neck, keep your dog’s coat in mind. If they have very thick fur, it’s possible that you might need to shave a small patch of their hair so the prongs touch their skin because if they aren’t, they won’t actually work. There are a few different types of bark collars available to you, each one using a different deterrent that might work better or worse for your dog. Any of these four methods - whether it is the static correction, vibration, spray, or sonic - can work well, but which one you choose really depends on your dog. This type of bark collar is the most well-known and most popular out there. They work by simply sending a short static pulse to the dog when it begins to detect barking or a vocal cord vibration. Use them for dogs of all sizes and set them to whatever level of intensity you’d prefer. That means that the same model can be used for all types of dogs - from timid ones that don’t need as much correction, to headstrong dogs that need just a little bit of a higher intensity. You might also see additional features included with static collars, like interruptive tone warnings and vibrations. Some might also increase the level of static if your dog keeps barking until it finds a level that works, making these collars the most effective type. A vibration collar will use a sensor to detect a dog’s bark before using an interruptive pulse to stop them - think of it like how your cellphone vibrates when you set it to do so. You can adjust the intensity of the vibration on the collar, too, but remember that these collars don’t have the same versatility as shock collars. There are also fewer models available, but they can be great if you’re not partial to the usage of shock. However, do keep in mind that these are not the greatest option if your pup has thicker fur as the vibration will have a hard time getting to them if it can’t get through the fur. These collars are a bit newer compared to the others, but they do what their name suggests. When your dog barks, a spray collar will spray a small burst scented with citronella or lemon that’ll reach your dog’s snout. Not to worry, though, since this spray is harmless to your dog, you and the environment. Since these collars are a little less jarring or frightening than their counterparts, you may want to choose a spray version if your dog is smaller or timid. Use one as a training collar, too, for added cost effectiveness and higher amounts of versatility. Remember to refill the solution, though and remember that these are just a little less durable than others. Make use of these collars to get your dog’s attention with high-pitched sounds that your dog won’t like, but that you won’t hear at all. This collar will detect the bark and emit the ultrasonic sound and you can even use vibration as an added stimulus. These are great for training dogs when they’re young or for using on small dogs, as well. Just adjust the setting so you can minimize the response to any nearby sounds, but do be aware that it may activate in response to other dogs. You can purchase a bark collar from anywhere these days, but if you want to get the perfect one for your dog, it’s important to consider a few things. This includes the size of your dog, the length of their fur, how it operates and the temperament of your dog. Ask yourself how quickly your dog learns and what learning type will be best for them. Think about your dog and their energy level, daily activities and overall temperament. If your dog jumps in the pool a lot or likes to walk in the rain, choose a collar that’s waterproof so that it’ll still work when your dog is playing around a lot or jumping in puddles. Most of these collars don’t require any human intervention at all, but for spray bark collars, you will need to refill the canister. If this is something you think you may forget, consider other possibilities. Consider which type of learning method will work best for your dog because not every dog will respond well to static and may instead become acclimated to the level that’s been set. Dogs may also realize that the spray cannister runs out after a while and bark just to empty it. Vibrations and sounds are the same way - but with vibrations, do make sure your dog’s coat isn’t too thick, either. Dog collars have really divided dog owners over the past decade, with some people complaining about the pain and others saying they work perfectly as training devices. If you’re considering one, there are many reasons why you should buy. These collars are very easy to adjust in terms of the settings and have improved greatly over the years. This means that you can change the shock levels to fit your dog so there’s no danger to them. With the wider range of levels, you’ll be able to find the “right” settings for your dog without worry and thanks to the safety settings, any shock will stop after a few seconds. These collars work to correct barking with only a few shocks since they get your dog’s attention very quickly. They can also keep your dog on your property without you having to keep an eye on them all the time, since these collars work while you’re in the house or away from home. This can make it a perfect solution if you’re out working for a while, or don’t want to bother the neighbors. When it comes to training, bark collars are a great option compared to a trainer. They’re far more affordable and can work wonders, too. Even dog trainers use them for a few hours a month to help train the dog without harming them. For you, personally, you might simply like knowing that you don’t need to worry about your dog barking at all hours of the day. Rest a little easier knowing you won’t bother your neighbors, as well. On the other hand, there are a few valid reasons for you to be a little cautious when it comes to bark collars. Before you buy one, keep these considerations in mind. By using a correction on your dog, you’re punishing them for poor behavior regardless of the intensity. This might create fear in your dog if they begin to associate specific circumstances or objects with the collar. They can even become stressed in response to the stimulation, that is why some owners and trainers prefer to use some sort of reward or positive reinforcement instead of negative reinforcement. Some of these collars can activate too often if they detect loud noises or barking from other dogs. This may be a problem if the collar continually goes off, convincing your dog that they’re doing something wrong when they aren’t. There have been some concerns about dog owners using these because it’s possible to accidentally correct your dog too much, mess up the timing of the correction, or use it in the wrong context. This can include the collar activating in response to an outside noise, or moving onto a higher level of correction when there’s no need. As with any piece of technology, it is possible for these collars to malfunction, causing serious issues. Your dog can develop such a high pain tolerance that it increases the level for no reason. It’s entirely possible that your dog will adjust to the level of correction that’s set. As the collar tries to get them to stop barking, they may just continue without paying attention to the collar at all. However, it depends a little bit on your dog’s personality and temperament. There are many owners out there who are simply tired of their dog barking all the time and who worry about disturbing their neighbors. With the best bark collar, there’s no need to worry anymore, as long as you find the right one. Consider what type of collar might work best, along with whether you feel it’s worth it for you and your dog. Have you tried a bark collar before? Send us a comment to let us know how it worked, or ask us questions below.